"Ruth was recommended by a friend who sang her praises for gifts as a holistic massage therapist. I have been gratefully impressed by her techniques and her ability to understand my body, its injuries, and postural problems. She is always generous and has great wisdom in how to maintain a healthy attitude to physical and emotional health. 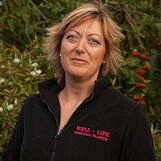 I would recommend her healing hands treatment to anyone with either superficial stress problems or more serious injuries." "I went to Ruth with a very painful tennis elbow. After just two treatments she rectified the problem and I was pain free. Whilst she was treating me she noticed I had a frozen shoulder and limited range of mobility. Ruth treated this with massage and exercise. I now have full functional movement in my arm. I would have no hesitation in recommending Ruth to anyone for treatment."